Waking up on the Herb River, just south of Thunderbolt, Georgia, we took our time getting going in the morning. We only had about 16 miles to go before transiting Hell Gate, another short section of the Intracoastal where we would need to be aided by the tide because of shoaling. And, with high tide not until 2:30 or so in the afternoon, we had some time. After a good breakfast with the last of our eggs, we raised anchor and made our way out the Herb, back into the Wilmington, and, before we could even get comfortable, into the Skidaway River. 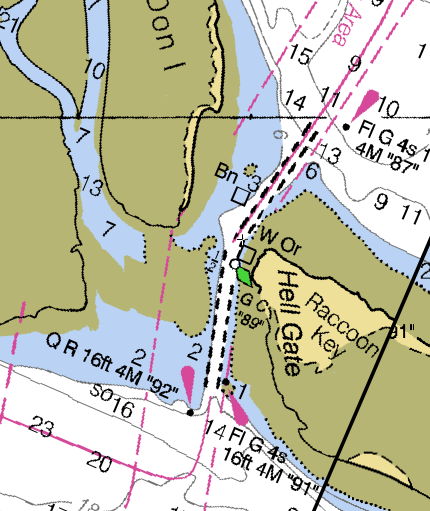 By about noon, or slightly past mid-tide, we were in the Vernon River and coming up on the R “86” marker that leads into Hell Gate. As we made the turn, the strength of the tide coursing up the Vernon became even more apparent, and we had to be very careful not to be pushed out of the channel to the north. Constantly watching both the markers behind and ahead to make sure we were staying in the channel, we aimed about 15 degrees off the next marker to correct for the strong flood current. Actually entering the cut and approaching the green “89” can, we kept to the center of the channel while the depth sounder dropped from the ten feet or so that it had been reading to the mid-eights. At one point while we were very near the buoy, we even saw a high seven foot reading. But, like most of the other shoaling we had encountered in cuts between rivers on the ICW, after we made it over that shallow area, the depths increased. And Hell Gate was such a short little stretch that we were surprised to find ourselves in the Ogeechee River while we were still worrying about shoaling in Hell Gate, leaving us scrambling to find green “93” upriver to our right. 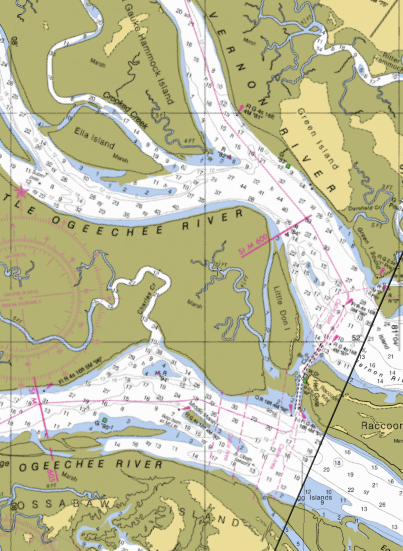 With the tide pushing us, we made quick time up the Ogeechee and into the Florida Passage, where we finally started to encounter the flood current on our bow again as we entered the Bear River. 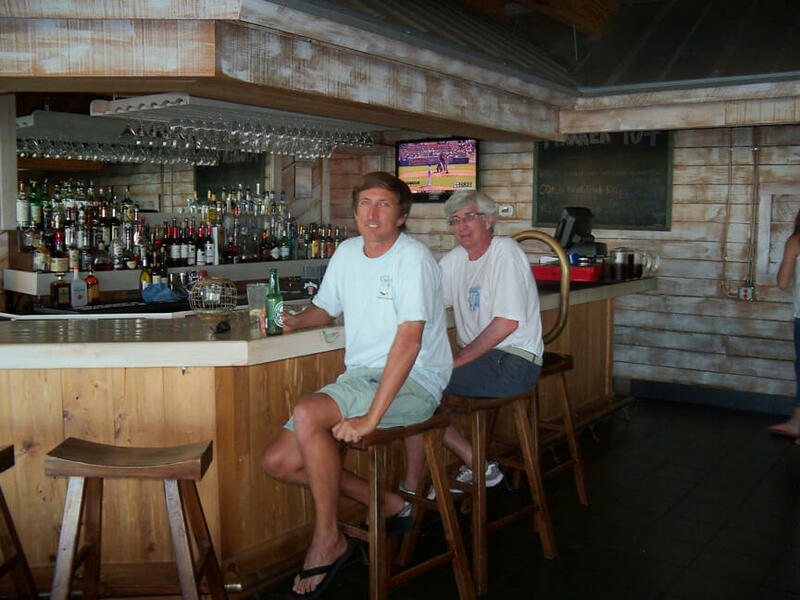 But we did not have too far to go against the tide as we made a short day of it, anchoring up in Kilkenny Creek so that we could dinghy into a waterside restaurant, Marker 107, for dinner. I highly recommend Marker 107 restaurant. It was an easy dinghy ride in from our anchorage in Kilkenny Creek. The staff was very friendly. There was a fine selection of food which was very good. It had a nice beer, wine, and bourbon selection. It’s the kind of place that if I was a local I would frequent it often.